Triggering an electric shutter release cable for digital or film cameras. Emulation of IR remote controls to operate still camera shutters or start and stop movie cameras. Triggering Sony still and movie cameras that have an "ACC" jack (LANC protocol). Triggering the rotation of a motorized device for time lapse panning and dollies on tracks. Triggering a water valve to release water drops and photograph the splashes at precisely timed intervals. Triggering other devices with a switch closure. The following specification identifies what the Time Machine can do at the present time. As new features are added, The Time Machine can be easily updated by replacing the main program chip. 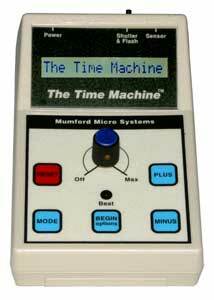 The Time Machine is housed in a small, hand held enclosure with a 16 character LCD screen, five push buttons, and a sensitivity control. At the top end of the enclosure are four jacks. A sensor input jack accepts a variety of sensors to trigger the exposures. 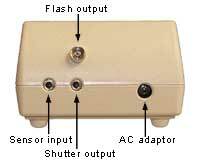 A shutter output jack is used to trip an electric shutter or emulate infrared remote controls. The flash output jack (PC female) is used to fire an electronic flash. The Time Machine runs on a built-in nine volt battery or an included AC adaptor. For longer periods of unattended operation, it can also be powered by an external 12 volt battery. All settings are entered with the keypad and parameters are displayed on the built-in LCD screen. You don't need a computer to program it or interpret your settings. They are entered and displayed in plain English. And with a built-in battery you can easily take it anywhere you take your camera. The Time Machine was invented by Bryan Mumford and is assembled by hand at our facility in Santa Barbara, California. We are specialists in time, and also make the well-known MicroSet Precision Clock and Watch Timer used around the world to measure and calibrate precision clocks and watches. The crystal timebase of each Time Machine is calibrated by hand to a precision of 4 or 5 parts per million. There are several "modes", or functions, programmed into The Time Machine. Each mode is displayed by pressing the MODE button one or more times. To execute a mode, press the BEGIN button. This mode will capture images of very transient subjects at night or in a dark studio. It opens the shutter of the camera (in bulb mode) for a specified time (from one second to 99 minutes). It then waits for a trigger event from a sensor, like an insect or bat flying through a sensor. As soon as the sensor registers a trigger event, the flash is fired and the shutter is closed. The Time Machine can be programmed to wait a "timeout" period between cycles, and the shutter is then opened for the next exposure. You can also limit the total number of cycles that are executed. This mode will take multiple exposures at preset intervals of time, from one second to over 24 hours. It allows you to automatically take many pictures of a changing subject. Time lapse sequences (of clouds flowing or flowers opening) can easily be combined into QuickTime movies with a variety of programs. The Time Machine can use a time lapse light sensor to limit exposures to daytime, nighttime, or both. For example, a camera can be left unattended for construction time lapse projects and not take pictures after dark. An optional 24 hour timer can be used to start shooting at the same time each day. We also offer several motorized devices that can be triggered by the Time Machine to take time lapse movies of a scene that pans, by rotating the camera a tiny amount between each exposure, or by pulling a camera down a track. Ramped pans are possible with the Enhanced Rotary Table. This is also a time lapse mode that will take pictures at specific times of day. You can enter up to 100 different times for exposures. You can then set a built-in clock, and as it runs, pictures will be taken at every time that you programmed. Exposure times are stored as hours and minutes in the 24 hour format HH:MM. Exposure times are stored in non-volatile memory so they're preserved when the Time Machine is turned off. This mode is used in construction time lapse when you only want a few exposures each day, or for security and monitoring purposes. A special behavior is implemented if only one time is entered for the Timed Shoot mode. In this case, a picture is taken at the time specified, but then the Time Machine jumps to the standard Time Lapse mode and more pictures are taken according to those settings. In this way a time lapse sequence can be configured to begin at a specified time when you aren't present. The following example will illustrate the complex tasks that can be accomplished with these Setups. Suppose you are shooting high speed photographs of a drop of milk as it falls into a saucer. You can program the Time Machine to fire an electronic flash 0.150 seconds after the milk drop has triggered an optical sensor. Let's suppose the drop is about two inches above the saucer when the flash fires. The Timeout interval is programmed to 15 be seconds, giving your camera time to store the image or advance the film. The Time Machine is programmed to open the shutter when the Timeout interval has only 1 second remaining. This prepares the camera to take the next exposure. The next drop of milk falls and triggers the optical sensor, and the Time Machine waits .150 seconds to trigger the flash again. But the Advance delay has been set to .0020 seconds, and this is added to the Trigger delay. The second exposure is therefore taken 0.152 seconds after the drop was detected, catching the milk drop just one inch above the saucer. The Time Machine continues in this manner, automatically advancing the delay and taking another exposure every 15 seconds. With no intervention from the photographer you can take as many pictures as you like in such a sequence, capturing the whole range of motion as the drops fall, strike the saucer, splash, bounce, and collapse. The amount of advance per frame can be as small as 100 microseconds. To see a sample of such a milk drop sequence taken with an interval of .0005 seconds, CLICK HERE. Time lapse sequences of mechanical devices, like clock movements, can be made similarly with perfect synchronization to the mechanism because the individual photographs can be synchronized to the motion of the mechanism by a sensor. An alternate Setups Mode is installed when you order our Enhanced Rotary Table or Moco Time Machine to create programmed pan effects that start at rest, ramp up to a speed, pan, and then ramp back down to no motion. This feature requires our enhanced rotary table with finer increments of travel. Click here to see an example of time lapse panning shot with the Time Lapse Panning Mode. The Movie Mode is used to trigger a camera for a programmed interval in response to a sensor. Typically, the camera will be triggered with the Lanc protocol. The Time Machine will send a START command to the camera when the sensor is triggered, and a STOP command when the specified interval is over. You can also start and stop many cameras that use an infrared remote. DV cameras will typically shut off after a few minutes of idle time. The Lanc protocol will "wake up" the camera so this is not a problem. But if you use the infrared remote to start and stop the camera, your sensor must be triggered within the "sleep" interval or the camera will have turned itself off. To overcome this the Movie Mode has a "keep awake" function. You can specify a keep awake interval of one to 255 minutes. If this many minutes go by with no sensor trigger, the Time Machine will run the camera for short time (progammable in tenths of a second) to keep it powered up and ready. This can also be used to produce an interesting time lapse effect. You may think of this as an intervalometer mode for the movie camera. The Movie Mode can also be used as an intervalometer in the following way -- we can fabricate a "dummy plug" for the sensor jack. This merely keeps the Time Machine in a triggered status, as if a sensor was always active. You set the Movie Mode to record for as long as you wish, and set a timeout interval for the number of minutes the Time Machine will wait after recording before it starts again. Once started, the Time Machine will start the camera and record for the specified interval, then turn off the camera and wait for the timeout interval, then shoot another interval. If you had selected two seconds for the filming duration and one minute for the timeout, you would record about 19 minutes of tape spanning a ten hour period in two second segments. This mode uses a high speed photodiode to measure the duration of an electronic flash in millionths of a second. To take high speed photographs, your flash must be faster than the motion you're shooting. But there's no easy way to know the actual duration of an electronic flash. The Time Machine will measure flash duration to a millionth of a second and allow you to know whether or not the flash you're using is fast enough. It also allows you to see how the flash speed changes with adjustments to the intensity. It should be noted that precise measurements of flash duration require more sophisticated tools. The reading obtained by the Time Machine varies with distance from the flash and does not compute a "discharge curve". But it readily shows you the relative duration of different flashes and flash settings. This mode can also be used to measure the shutter speed of film cameras. You open the camera back and arrange a bright light to shine through the lens. The photodiode is positioned at the film plane and the shutter is tripped. The Time Machine will display the shutter speed in millionths of a second. This mode uses a high speed photodiode to measure the time between tripping the shutter and taking a picture. It uses an electric shutter release cable to trip the shutter, and then measures the time until the built-in flash on the camera fires. It can also be used to measure the lag between tripping an electronic flash and getting the light. The time delay is displayed in millionths of a second. This mode works with a special two-element photo detector to synchronize the flash to a projectile. The two elements of the detector are exactly four inches apart. Suppose this is arranged in front of a pellet gun being fired at a light bulb. The Time Machine allows you to enter a "multiplier" value for the Ballistic Mode. Suppose you enter "five" for the multiplier. When the Time Machine detects the pellet go through the detector, it will measure the time it takes to travel the four inches. It will then wait exactly five times that long and fire the flash. This will capture the pellet when it's exactly twenty inches beyond the sensor (four inches times the multiplier of five). If the light bulb had been placed seventeen inches from the detector, the flash would capture the pellet just as it exited the light bulb. Click here to see such a photograph. In this way it becomes easy to take photographs of high speed objects in precise relationships to their targets. The Time Machine even calculates the speed of each projectile and displays it as feet per second after each shot. The current output type: shutter, bulb, flash, or Lanc protocol. Duration of shutter contact: .01 to 2.55 seconds. Duration of flash contact: 10 microseconds to 2.55 milliseconds. 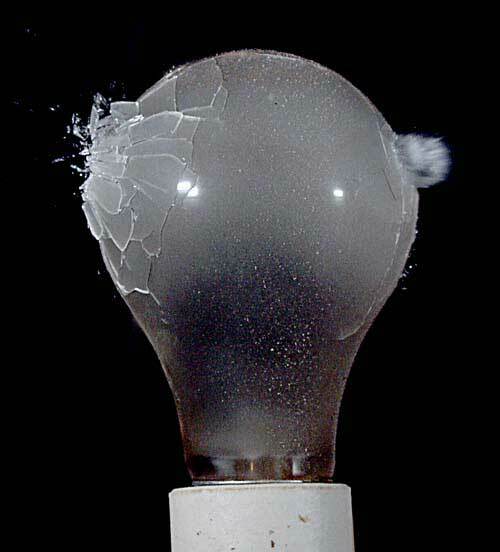 Duration of bulb contact: 1 second to 59 minutes. Whether or not to use a double shutter press to raise a shutter mirror or wake up a sleeping camera. Whether or not to fire the flash in advance of a shutter contact. If so, how long before (.1 to 25 seconds). Whether or not to fire the flash immediately after each shutter contact. Whether or not to provide 5 volt power to the shutter jack. Whether the power to the sensors is always on or switched off before each exposure. (This insures that the laser sensor will not be seen in the photographs). The Time Machine can be ordered with an electroluminescent backlight. This illuminates the display so you can see what you're doing in a dark studio. The backlight can be turned on and off with the keypad of the Time Machine.